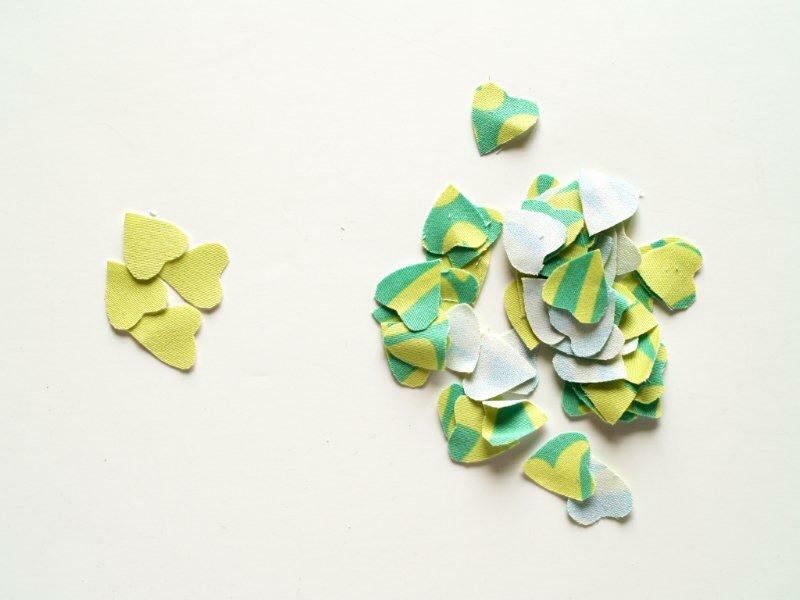 Start by cutting out your background fabric. Cut it just a little wider than your frame size. 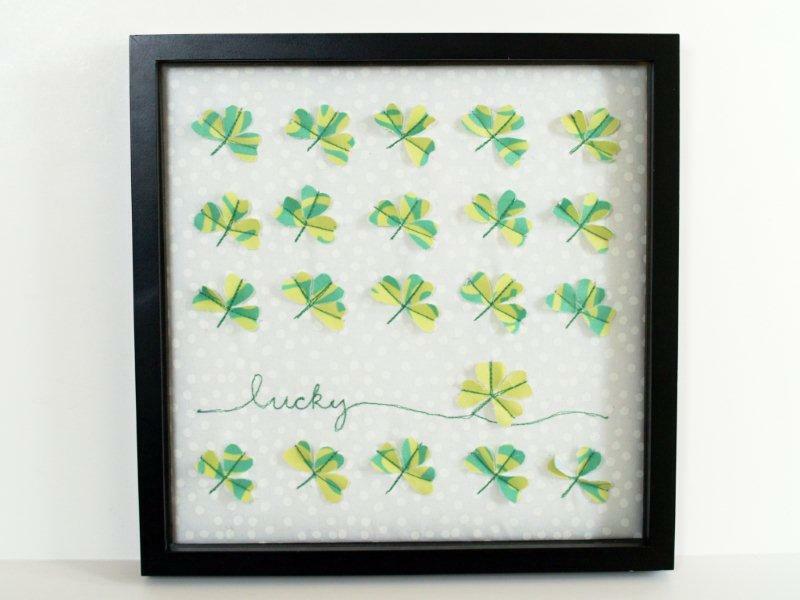 Decide how many rows of shamrocks (or whatever design you’re doing) you would like. I wanted 5 rows across and 5 down. 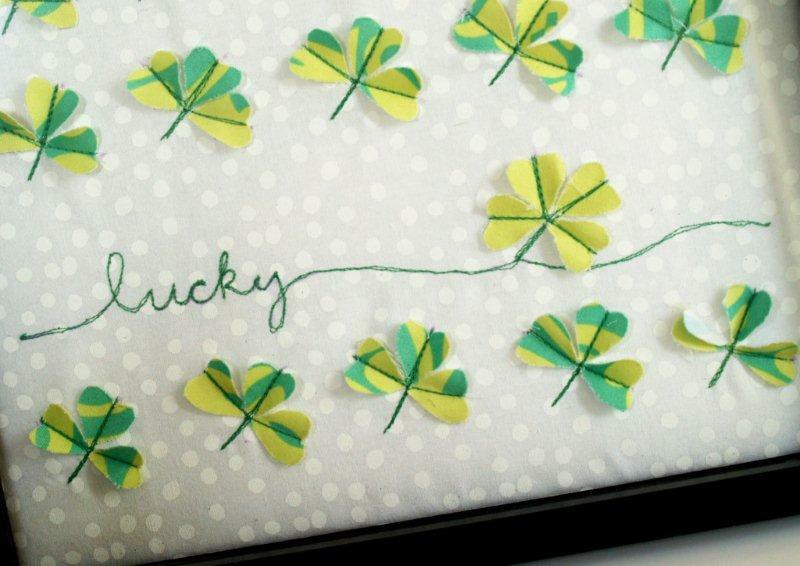 Mark out your rows with a disappearing fabric marker. 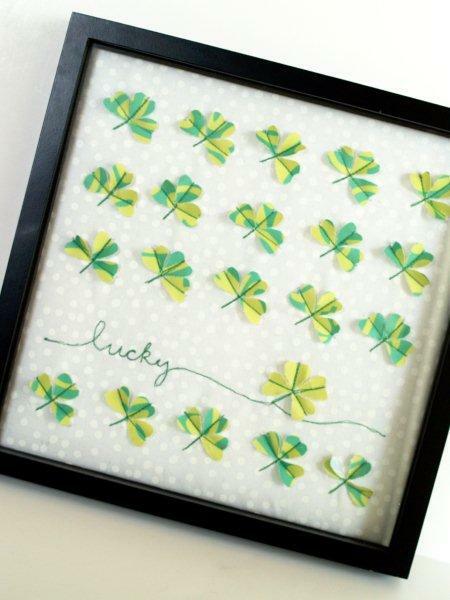 Now cut out your shamrock pieces. I used small hearts for the petals. The heart measures about 7/8″ from top to point. 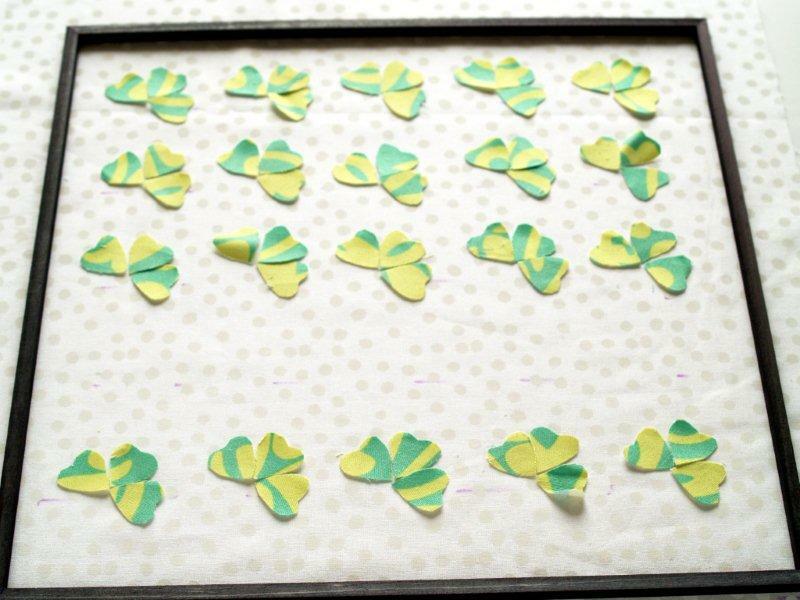 I did 4 rows of regular 3 leaf shamrocks (so 60 hearts) and 1 row with 1 4 leaf clover. 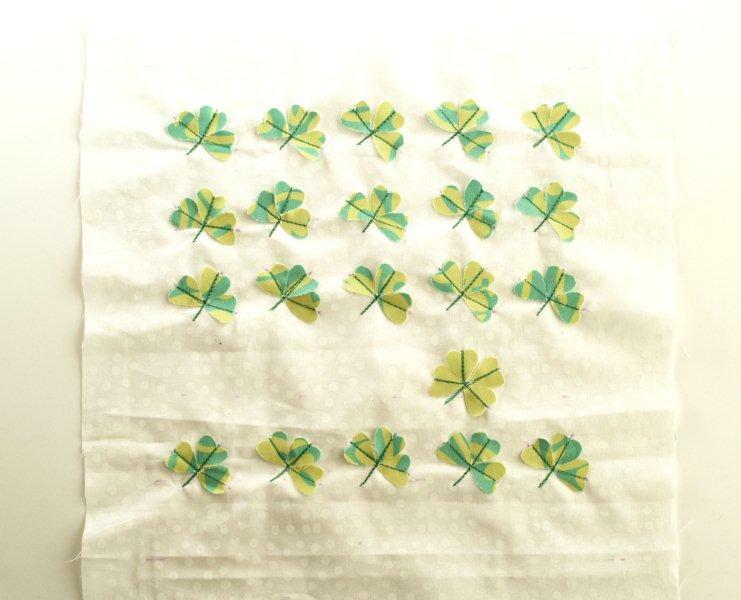 Lay out the center row of shamrocks, with the center of the bottom right heart lining up with the marked line. 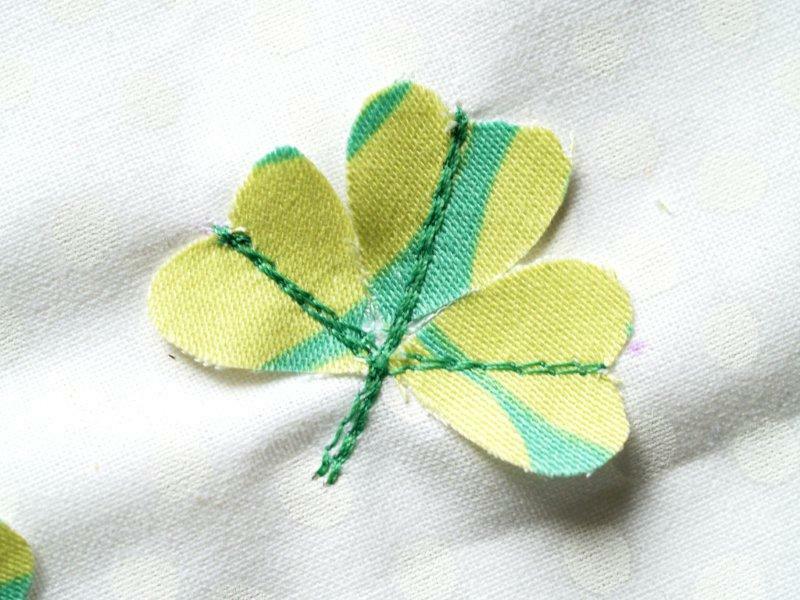 Then place the two remaining hearts to the left of that, so that the clover is a little angled. Lay out the two end rows next, lining them up the same way. Layout the inside two rows next. 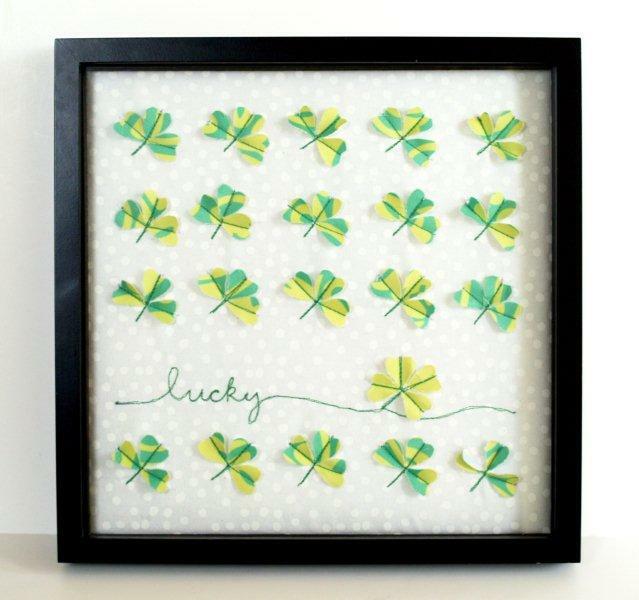 Last, lay out the four leaf clover in the empty row. It should line up with the 4th column of clovers. I figured out partway through the sewing process that pins were not the best way to keep track of where the hearts go. 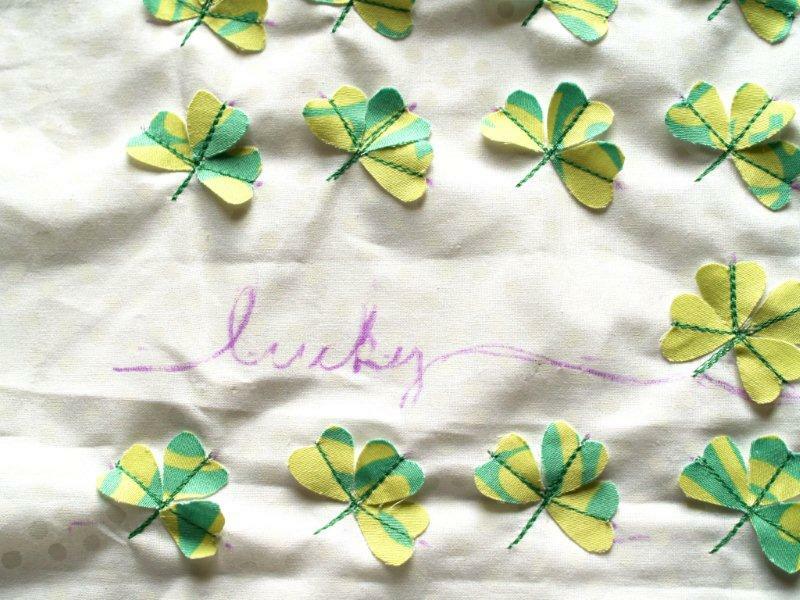 Just mark the “V” of the heart with the marking pen, then you can line them up as you sew. Start with the far left heart. Sew down the center and then sew up the center of the far right heart. Turn the fabric 360 degrees and go back over this stitching line. Sew back to the center point. Turn the fabric and sew up the center of the middle heart. Turn the fabric 360 degrees and sew back down the center and continue down 4 or 5 stitches to make the stem. 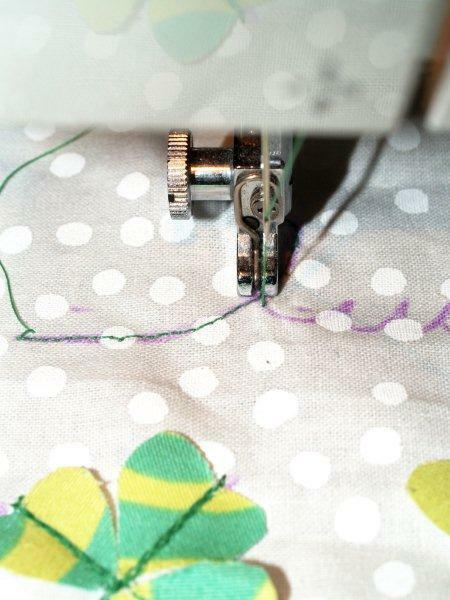 Sew up the stem and center heart one more time in each direction. Sew back up to the center from the bottom of the stem. Finish it off with a locking stitch. 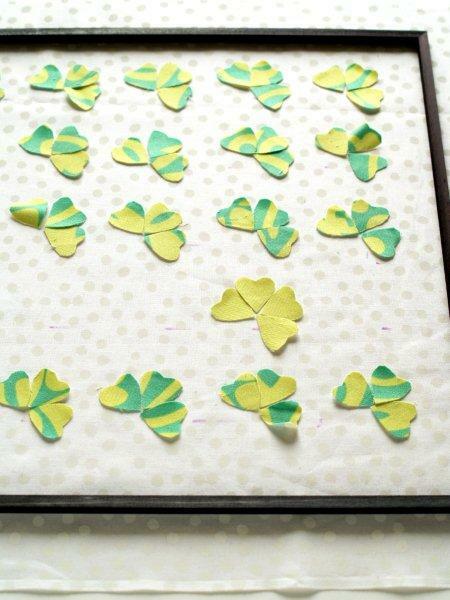 Start with the top row and sew all the clovers down the same way. 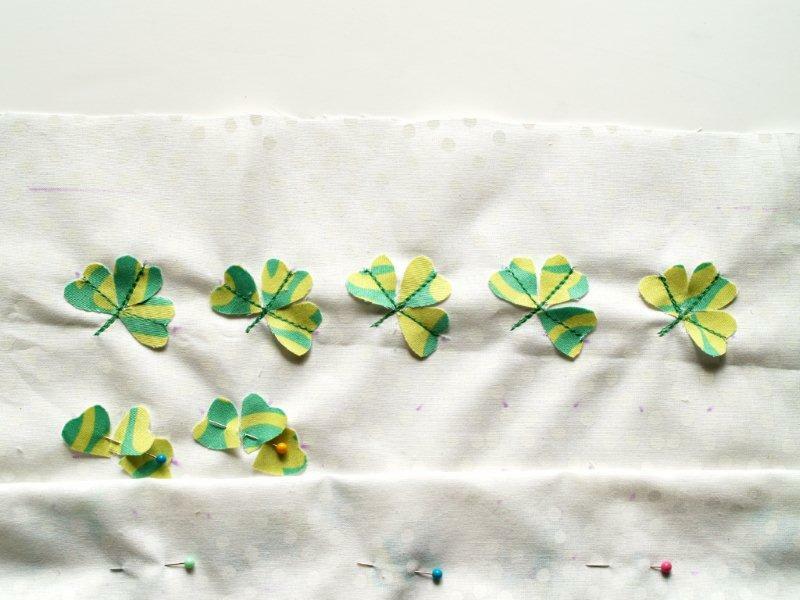 You don’t have to cut the threads after each clover, you can clip them all at the end of the row. 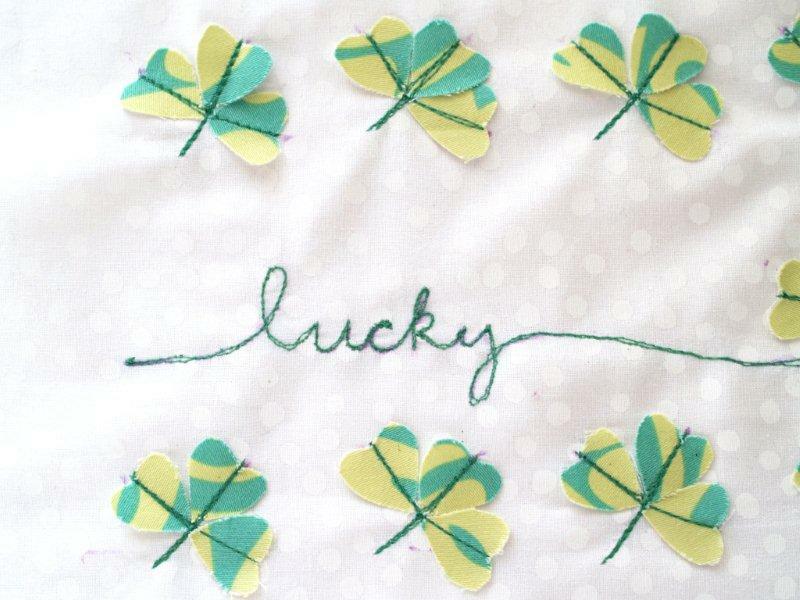 Continue sewing on the clovers down all the rows. 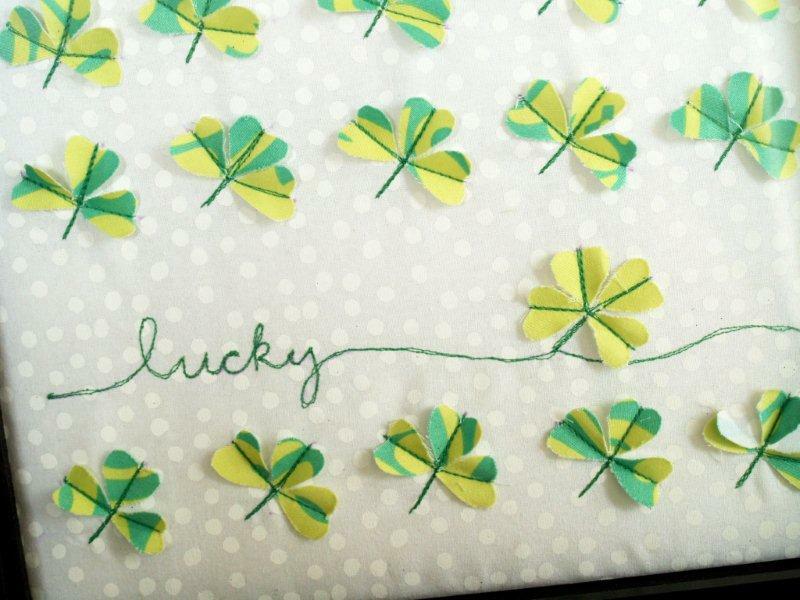 Now that your clovers are all sewn on, write out the word “lucky” in the space by the 4 leave clover with your marking pen. Take the pressure foot off your machine. We’re going to follow the marked line with machine stitching, just like the Hoop Art last month. 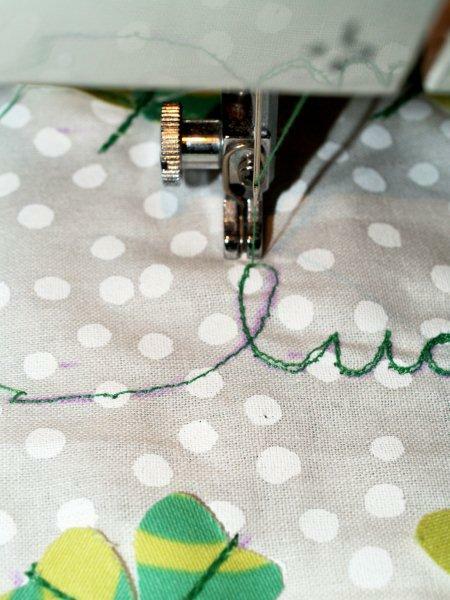 Start with your needle at the left side of the fabric and pull your fabric through as you sew. The faster you pull, the longer your stitches will be. Don’t worry too much if you’re a little off the marked line, you can fix it on your second pass. 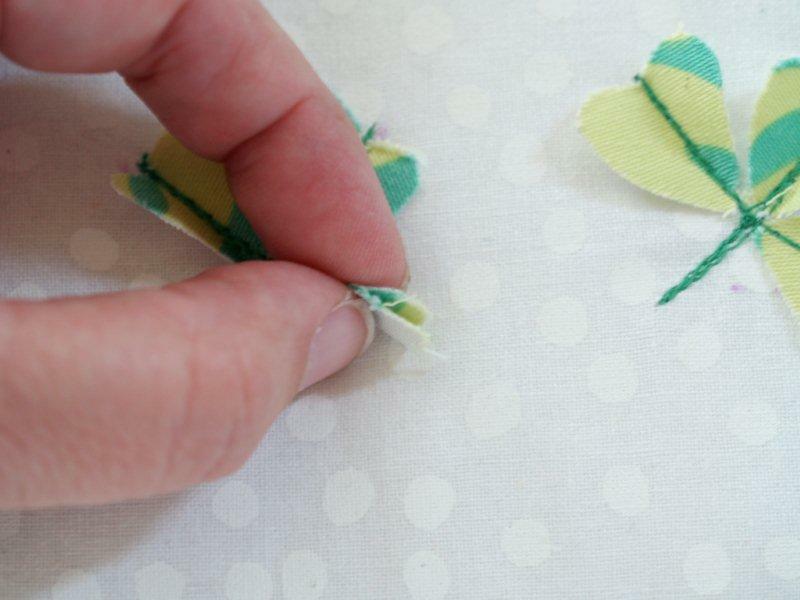 Continue all the way to the right side of the fabric, then go back over your stitching all the way to the beginning. 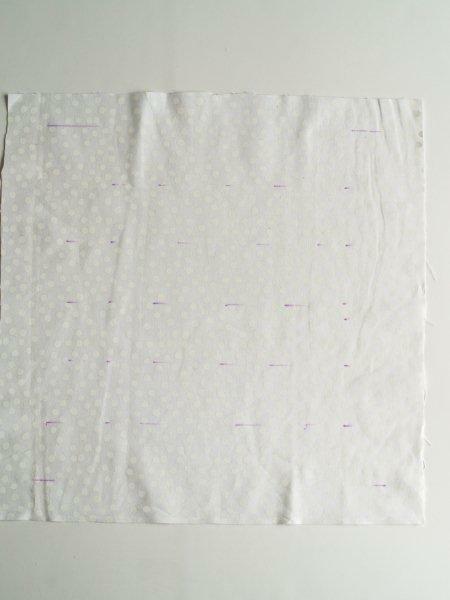 Remove your marked lines and dots and press your fabric. 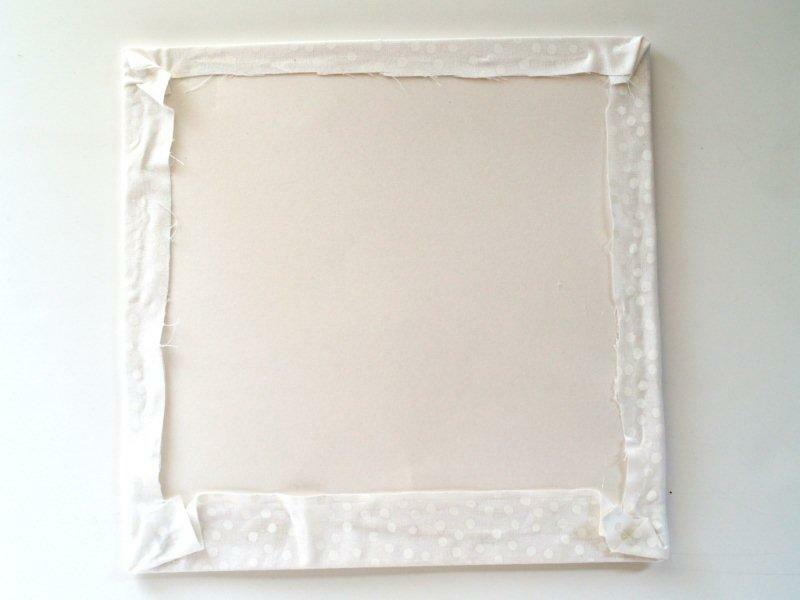 If you like the finished look to be a little padded like mine, place your fabric face down, then place a piece of batting on that, then top it with your posterboard or chipboard. 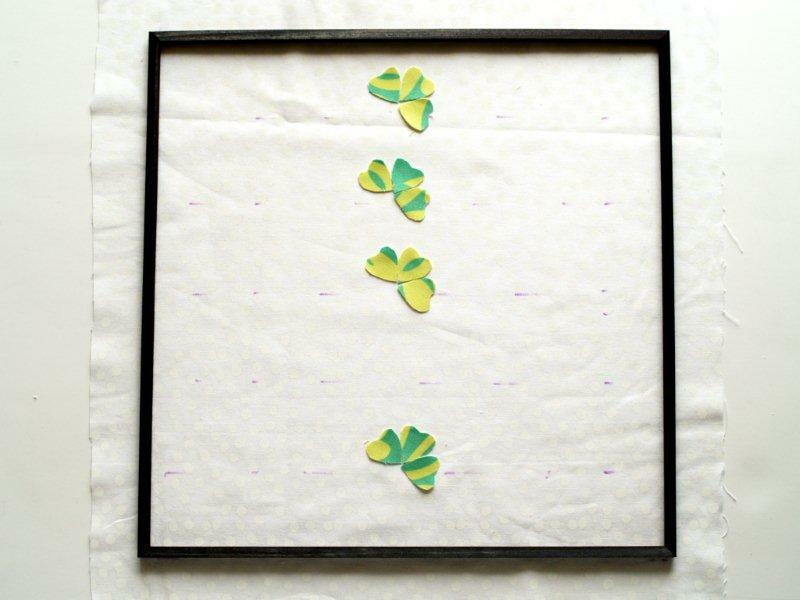 Hot glue your edges around the posterboard, pulling the fabric tight so that there aren’t any puckers in the front. Flip the fabric back over. 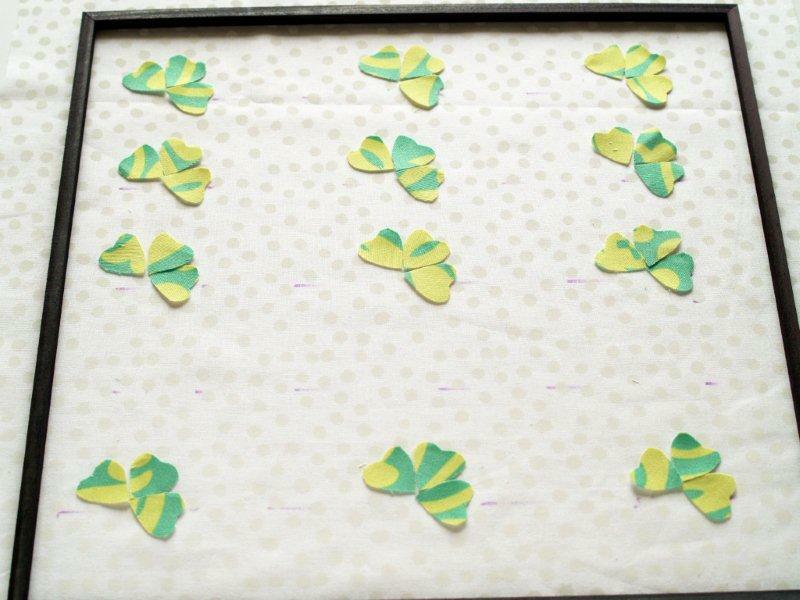 Finger press the clovers up a little so that they stand off the fabric. You can do this by pinching the heart around the stitching. 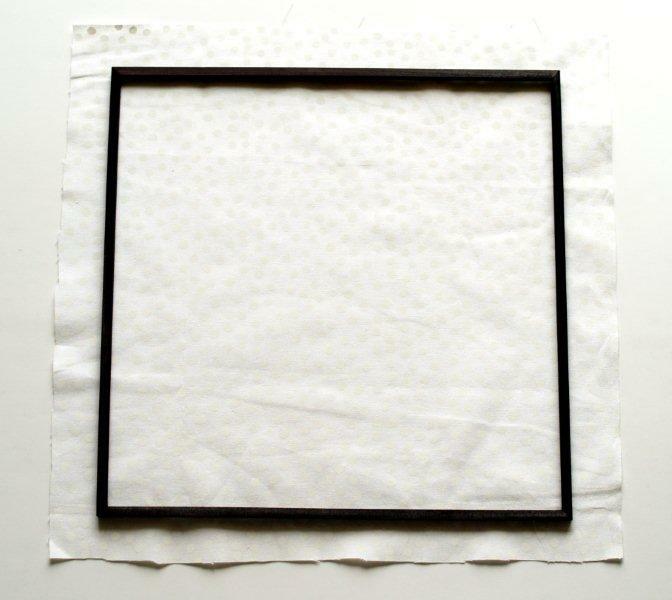 Pop the finished artwork in your frame and you’re done!